A conifer is a cone-bearing plant. 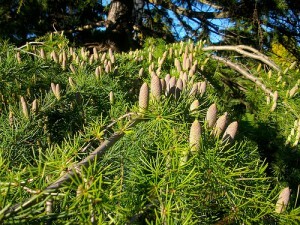 Most conifers have needle-like leaves and many are evergreen. In addition to absorbing and filtering groundwater, conifers are well-known as excellent air pollution reduction sources. The northern forests consisting primarily of conifers are crucial carbon sinks for the balance of the Earth’s ecosystem. All species of conifers are woody plants. Pine trees, spruces, and firs are a few examples of conifers. Many conifers are excellent additions to home landscapes, but make sure the species of conifer you choose is adapted to your unique property’s characteristics!